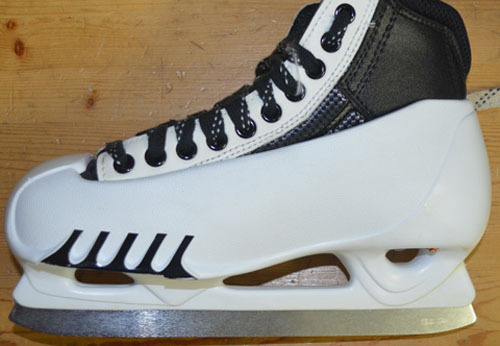 Like most manufacturers, Graf has designed their new shell for use with different model skates. 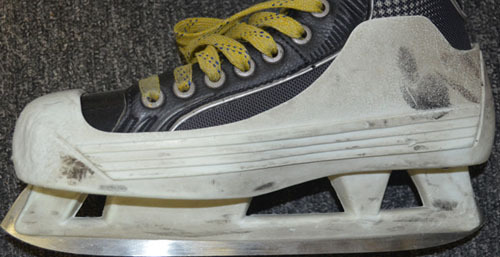 The difference between a lower and higher end skate will be the quality of the boot, not the shell, which remains the same. All that concerns Overdrive is the type of shell used, and since the same shell is used for all three models (4550,5550,7550), then the installation information on this page applies to all three models. As for the quality of the shell, I have some comments on that at the bottom of the page, after the install instructions. 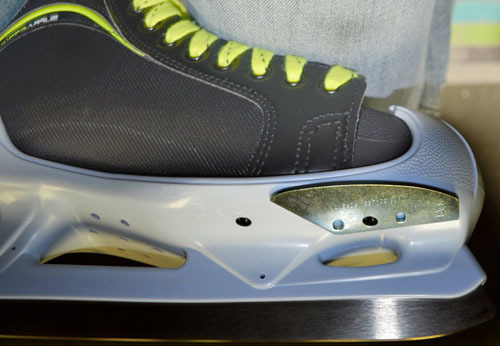 If you're thinking about getting these skates, you really should have a look at this information. The Cobra skate with the plastic extension was trouble (see the Graf install page), and while the new shell removes that problem, I'm fairly sure Graf has made another big mistake with this shell. To the left is a shot of Overdrive installed correctly on the new Graf. As far as the Overdrive install is concerned, this is a huge improvement over the Cobra style shell, which was trouble to fit. 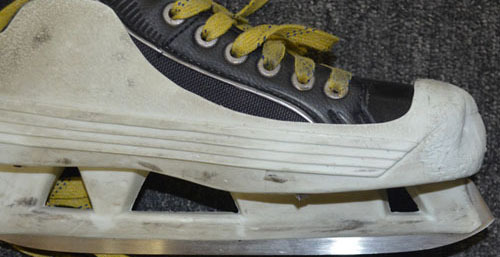 Now, it's one of the easiest skate to install on. 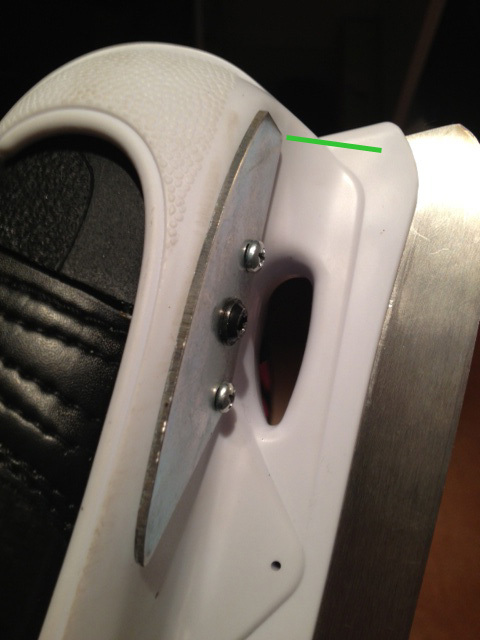 As with all skates, the front of Overdrive should line up with the point where the blade holder meets the boot. The green line to the left shows that point. He installed the blade using two of the screws provided with Overdrive, and as luck would have it, the Graf screw lined up with the middle hole of Overdrive. I've noticed that the placement of the Graf screw has always been very accurate. On other brands, the placement of the rivets varied slightly, but Graf has been consistent in the past, so you may get lucky here. If you find that the Graf screw lines up with the middle hole, by all means, use it, because it will save you a lot of trouble. The hardest part of the install is always the first hole, so if that is already done for you, it make things a lot easier. 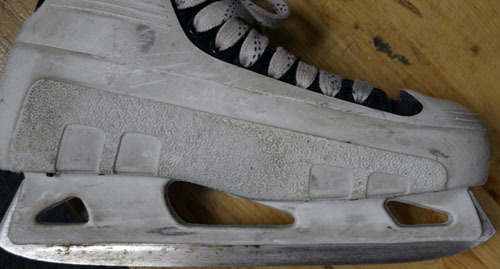 To the left is another look at the same skate for an idea of the in/out positioning. 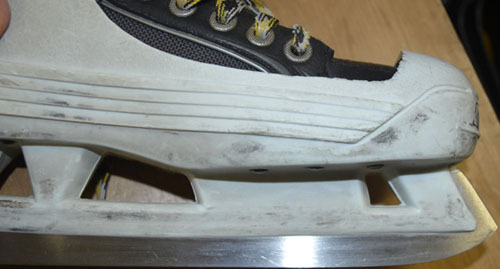 As with all skates, in/out positioning should vary between 1/16" and 1/32", no more and no less. That is actually a rather wide margin of error, and you can easily eyeball it. The edge of the new Graf boot is fairly square-ish, so this makes judging the in/out positioning much easier than with a rounded boot, which can trick the eye as to how much it is sticking out. To the right is another skate showing the proper in/out positioning. 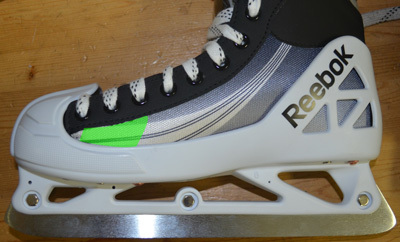 On some skates, you can double-check the in/out positioning by taking a measurement off of the blade (green line), but I wouldn't recommend it with the Graf. It's much easier to judge the proper distance from the edge of the boot, as in the photos above. 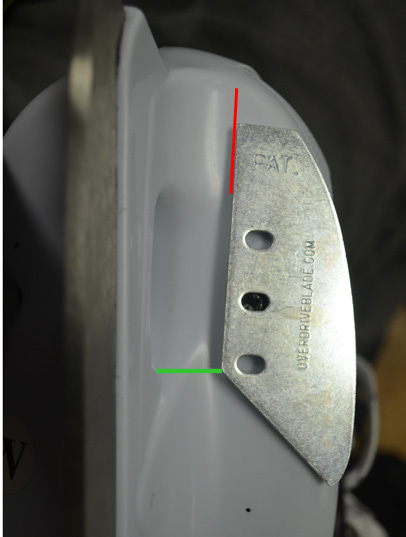 When Overdrive is installed correctly, the line of the blade (red line) leans out slightly and is not parallel to the main blade. 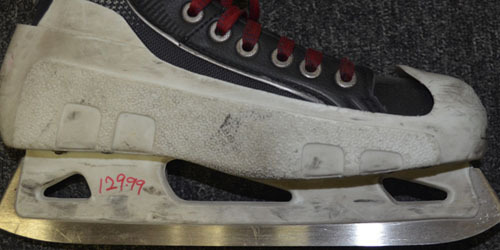 To the left is the same skate as above, installed using the Graf screw, which happened to be in the right spot. To the right is another Graf skate, and I placed Overdrive on top of the screw. 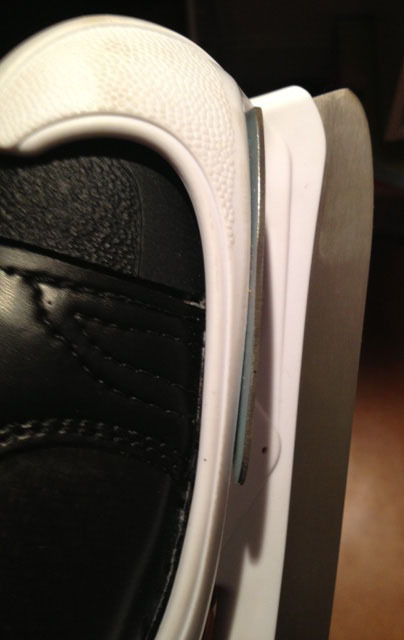 Here, if you used the Graf screw, the blade would sit a little too close to the heel - compare the green lines. The photos were taken at different angles, but even accounting for that, you would be pushing it a bit if you used the Graf screw on the right. 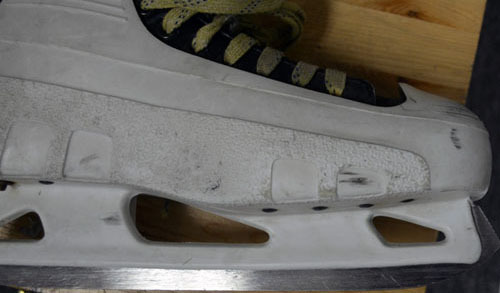 I suppose it depends on the size of your skate, but if you find the Graf screw is close enough to use, a little closer than the skate on the right, then by all means, use it. Finally, on the skate above left, if you can, drill to the outside of the slotted Overdrive hole so that the blade doesn't shift when it's hit by the puck. 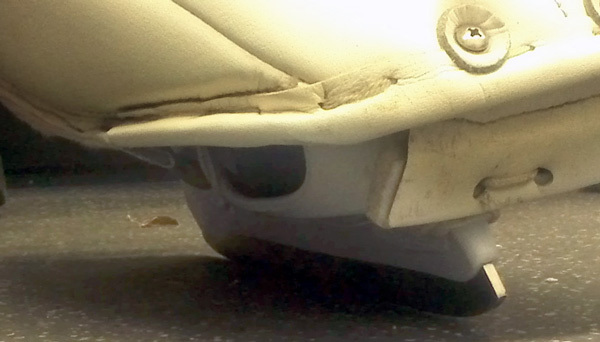 The top hole of the skate above left was drilled on the inside, though sometimes you have to do that on the top hole, because it can be a tight fit inside the boot to thread the screw. 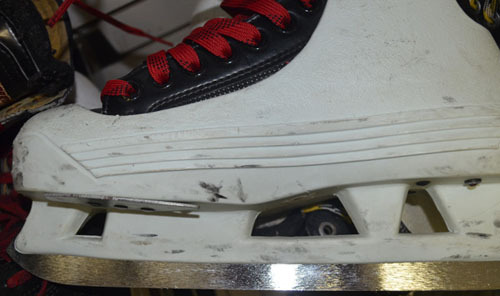 The only other thing I should note about the new Graf is that one customer asked me for some shorter screws because the normal ones I provide stuck out a lot, indicating that the sole of the skate was quite thin. This has happened once in a while with the Grafs in the past, so I'm not sure if this is going to be a common trait of their new models. If that is the case, then I'll have to start providing shorter screws for the Graf, which is no big deal, but I will need to know that you will be installing on grafs so I can provide shorter screws with the order. To the left is the same photo of the skate above, but with a green overlay on the area that concerns me the most. 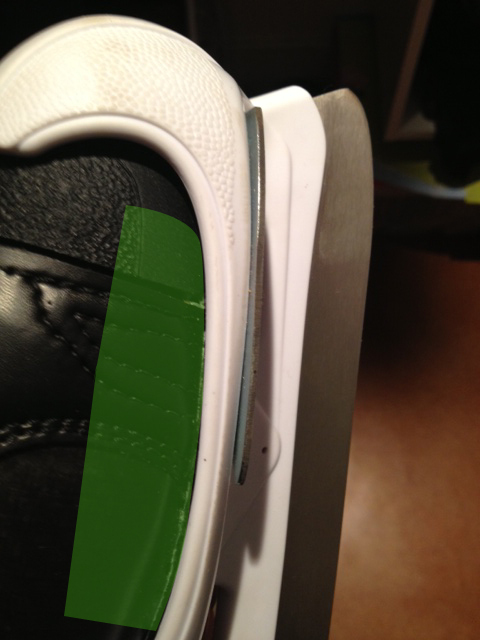 Graf has removed a lot of the protection on the inside of the foot, and while some of it could safely be removed, I think they went too far, and the green shaded area presents the biggest problem. 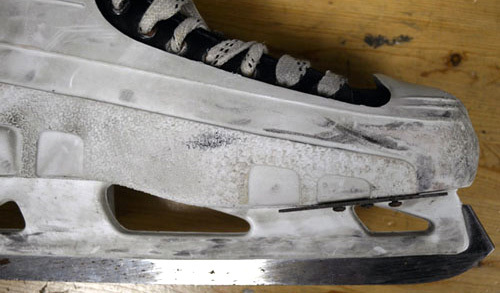 Presumably, this was to lighten up the skates, which is always a good idea, but I never, ever lighten up equipment at the expense of protection. I wear an RBK shell, and they did the same thing, but not to the extent that Graf did. If they covered up a bit more of the green area, then I think this would be the perfect combination of weight reduction and protection. Above is an RBK shell, and I'm happy with it, except that once, I took a slapshot that hit the green area, and I felt it, a lot. It was a fluke that the puck got in there, but all goalies know how pucks find the weak spots in your protection. 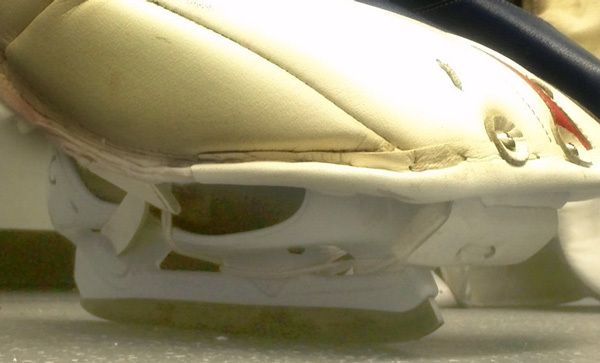 Perhaps Graf thought they could safely remove all of that protection because nobody does the old-style kick save anymore, the one that exposes the inside of the foot. That move is long gone, but the protection on the inside of the skate is still relevant, because goalies now wear their pads very loose. This allows the pad to rotate as you drop into a butterfly, but this looseness can also cause the pads to over-rotate at the wrong time, exposing the inside of the foot when you go down, when you move cross-crease, or any time you move awkwardly. If Graf thought they could remove that protection because pad manufacturers are putting foam at the bottom of the pad, then that is a mistake for all the wrong reasons, and I explain why at the bottom of the page. To the right is a shot of my friend Dan's skate and a view of what the puck can see. Of course, when you're in your stance, the skate will roll over and so will the pad, effectively covering up the green area in question. 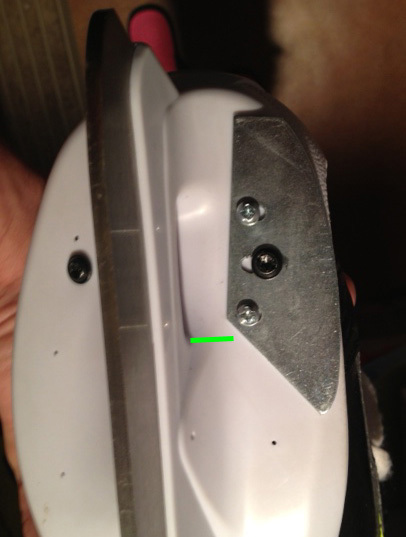 This is obvious, but what should also be obvious to the skate designers is how pucks always manage to find holes in your protection, and this is a hole, because you won't always be in a perfect stance, and in moving, you will expose this area. To the right is another shot of Dan's skate. Now, imagine his foot rolling down into a stance and his pad getting caught in the postion it is in right now. Maybe the tops of his pads hit, or he catches the top of the pad on his stick, or another piece of equipment - all of which prevent the pad from rolling down with the skate - this can easily happen. In that case, the foot rolling down will expose the inside of the boot even more. Dan hadn't had the skates for long, but he said he did get a few shots near the ball of the foot and he felt them. Above left is a shot of the Cobra skate and the coverage it offered, which was all the protection you would ever need and maybe a bit more. 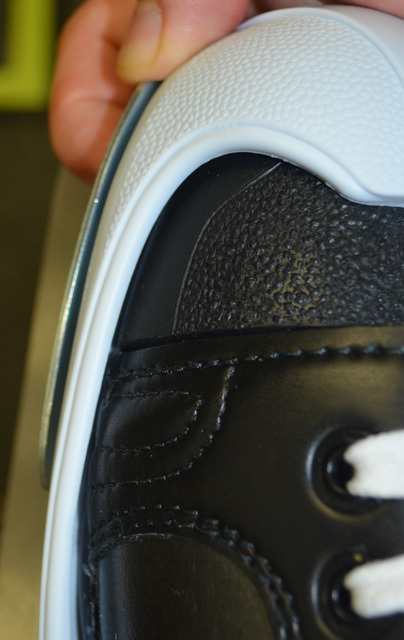 To the right is the new Graf, and you can see that they removed almost all of the protection on the inside of the foot, so there must be a really significant weight savings. However, have a look at the shots below and ask yourself if the weight savings is worth it. All I did was go to Toronto Hockey Repair and photograph some used goalie skates. None of the skates below have been Photoshopped, but if you don't believe me, just go and have a look for yourself. 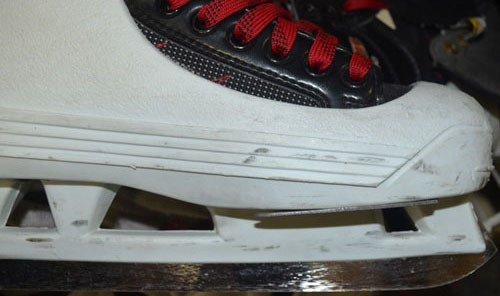 If you're considering buying the new Graf skate, I strongly recommend that you do the same. 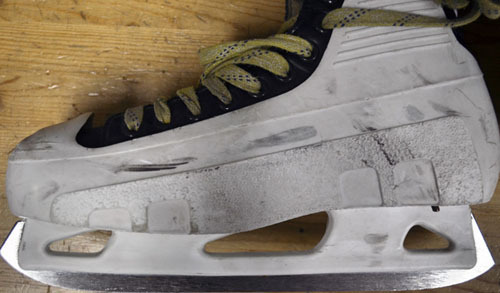 Look at the puck marks on some used skates and then decide if just the boot of the skate is going to offer you enough protection, because chances are, you will get hit there. 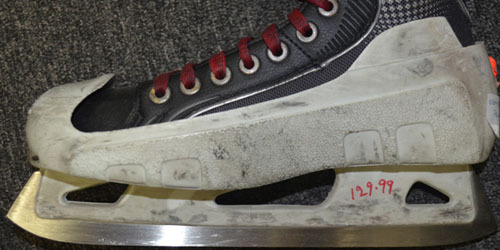 Also, keep in mind that over time, puck marks on skates do fade, so you are not seeing all the hits these skates took. AND PLEASE NOTE - If you are going to suggest adding foam to the bottom of your pad to cover the area, then go to the back of the class. In fact, get off of this page and re-read the 'About the Boot' page until you understand exactly why the inside of the boot can't have anything in the way, not the pads, not foam, not laces, nothing. The foot needs maximum freedom for maximum mobility. This is just an extension of the fact that the inside of the boot needs to be as narrow as possible, and if you're unsure about this, then go to the 'Graf Install' page, which explains why the area needs to be as narrow as possible. 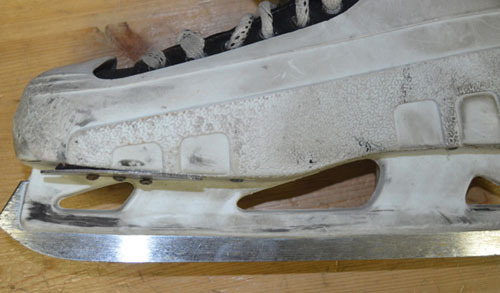 This is why Graf finally removed the plastic extension after only ten years; this is why Bauer put the cut-out on the Vertexx. Adding foam to your pad defeats this purpose and limits your mobility. It boggles me that some pad manufacturers do not understand this simple fact and insist on putting foam down there. In order to have an understanding of Overdrive, and to a lesser extent, an understanding of goalie mobility, you must be clear about how important the inside of the boot is.